Typical! Just as the UK finally gets a release date for Amazon's Kindle e-reader, US book giant Barnes & Noble release what is being widely reported as a 'Kindle Killer' over the other side of the pond – the 'nook' ebook. The book retailer unveiled the Nook in New York this week, which features a colour touchscreen display panel underneath the traditional grey and white e-ink reading screen. The nook also features Wi-Fi, via which book buyers can download books when in any of Barnes and Nobles 1,300 US stores. When away from the store, the device will connect to the internet via AT&T's 3G network. Perhaps the most innovative feature of the Nook is the ability to 'lend' your ebooks to friends for up to two weeks – which means that for that short period you would not be able to read the ebook in question on your own Nook. This is both simple and genius – as bibliophiles love to lend! The nook is on sale now in the US priced at $259, and is sure to give the latest (and similarly priced) Amazon Kindle a good run for its money this coming Christmas holiday season. 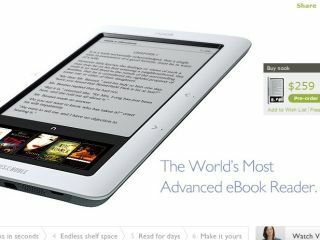 Publishing industry analysts at The Codex Group, estimate that Amazon has sold about 945,000 Kindles, compared with 525,000 Sony Readers to date. Forrester Research estimates that over 3 million e-readers are expected to be sold in the United States in 2009, with sales set to double in 2010. "That sound you heard was the air being let out of the Kindle's tires," wrote Gartner Vice President Allen Weiner on the company's blog. No word as yet on plans for a UK launch. For more head over to nook.com.